Weekends are pretty good for me. I get to sleep in, stare at the ocean, work on my various projects, and not think too hard about Sinhala Sign Language. I was planning on finding a photo shop in town and print out photos to give to the kids, but I was told the stores were probably closed today. Today is Deepavali (a.k.a. Diwali), the Hindu festival of lights and probably a big deal up in the Hindu Tamil-dominated North, but here in the South, it’s likely just an excuse to take a day off. In addition, this Tuesday is the end of Ramadan, so that’s another holiday (although I’m not sure if it’s a public holiday). Holidays abound, so I stayed in today, although I’m going to the school tomorrow with a couple DVDs for the kids to watch (and for me to interpret). Anyway! I’m happy to finally provide you with some visual goodness. At the same time, I will also attempt to impress you with my spelling prowess. After all, the Rohana student body contains some very formidable Sinhalese names, and these days, it seems like all I do is spell, spell, and spell. It’s International Children’s Day, and the girls are all lined up, single file, for the walk up the road. They’re doing a great job of it because I told them that the boys were lining up better than the girls were (they weren’t, but see, they got motivated!). I think it’s interesting to note that in Sri Lanka, the girls learn how to tie their ties way before the boys do. This is my Grade 8 class. They’re taking a test on English numbers from zero to twenty. 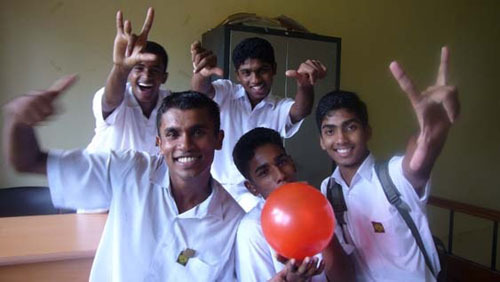 From left to right: Shirantha, Prasanna, Pasad, Udaya, Shan Ahmed, and Priyankara. They did pretty well except for Udaya and Pasad, who totally bombed because they missed most of the lessons. For International Teacher’s Day, the children beautifully decorated the multipurpose room, created badges for all the teachers (I got one, and I will treasure it forever), and performed a few dances and original skits. The girls here are concluding the pageantry with the singing and signing of Sri Lanka’s national anthem. This is Ruwan in 7B. The first two weeks, I put him and Milan through punishing A-B-C drills, and it paid off handsomely because I can now teach them words. Unfortunately, Milan’s been sick all week, so it’s been just Ruwan and me. He’s learning the names of six sports (he said he wanted to learn sports first). He can also understand, “I like _____,” and “I don’t like ____.” In case you’re wondering, it’s cricket and golf, respectively. His handwriting is atrocious, so immediately after I took this photo, I made him copy my handwriting letter by letter on the blackboard. After he saw his rewritten words, he beamed as if he’d created a Michaelangelo. We have a little playground in front of the main academic building, so the boys and I were just fooling around on the sort-of-merry-go-round-thingy. They just rock! Back on International Children’s Day, the girls haven’t lined up yet and are just wandering around. From left to right, it’s I-don’t-know, Janibha, and Shoshini. Shoshini (6A) is quite a piece of work. She loves nothing more than to recite the spelling of fruits (my lesson for the last two weeks), and every time she does it, she stands up, turns slightly to the side, and delivers a masterful, self-confident spelling performance. Her father owns Camp Coconut in Kamburugamuwa, and the kids go there every once in a while to go absolutely wild. This is one of my favorite pictures ever. After final bell one day, we just sat down in one of the classrooms and chatted for several minutes; a couple of them weren’t ready to go home yet. I’ll never forget what they asked me: “Do you know what S-E-X is?” Then they all started howling and hooting when I said yes. In back from left to right: Priyankara, Rajitha, and in front: Lakmal, Pasad, and Shan Ahmed. I have actually taken more than 700 photographs since departing Los Angeles one month ago, plus taken a lot of movies. I am also trying to get every single student’s sign name on camera so I can make a really fun DVD by December when the Grade 11 students take their O/L’s and (sob!) graduate. awwww, nice post!!! curious — did you get permission from parents or someone to post photos/names, etc? i remember some hullabaloo around this type of thing somewhere else. i love all the pictures but i have to say that last one is PRICELESS and really lik ethe one of you on the “merry-go-round” thingy. you are so great with students!! a badge for international teachers day!!!! that is sooooo sweet.. awwwww.. i love the sports words in the pic with ruwan too, so cute. Thanks for the pictures! I especially like the one with “rugby” on the blackboard — I read it as “fugly” at first (!!!) before I read your explanation that he was learning the names of sports. Yes, maybe a little more work on handwriting! I’ve really enjoyed your posts, thank you. Hey!! Where are you in Sri Lanka? I went to Sri Lanka 2 years ago before the Deaflympics. I was there during the tsunami (but I was at Kandy, away from the coast), and would like to know if some of the areas I visited are back to normal again. E-mail me, and we can compare notes! 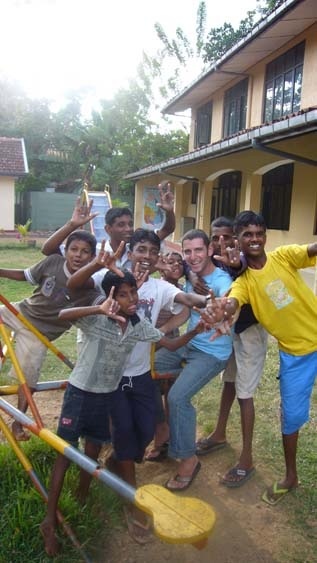 I LOVED Sri Lanka, and would love to go back there someday! Great Pix!!! Amazing how the visual brings yer adventure so alive for me. How goes the tsunami recovery? Have you seen much damage? I realize this isn’t in the USA with its data privacy laws, but don’t those children at least deserve some privacy in regards to their academic performance? Love the photos and cultural tidbits, definitely post more of these. The children are so beautiful, as are you, Adam. I love the photo on the merry-go-round thingy. Your writing reflects a profound commitment to your students. You must be so pleased about the progress you are seeing. i needed the pictures, thank you so much for including me… i love your eloquent writing i look forward to reading more. hugs. take a picture hugging a tree in sri lanka please! I am trying very hard to give sensitive feedback to this comment.I taught english in this school from June to the beginning of September, and 5 years ago i was in teaching for one year in a different deaf school in Sri Lanka. 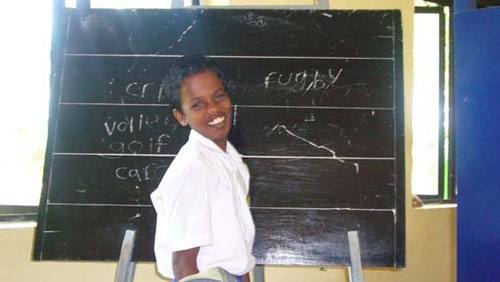 Its bad enough that the sri lankan government do little to nothing to improve the educational standards of deaf people in sri lanka, but wouldn’t it be just as, if not more appalling and irresponsible for the rest of the world to ignore it? Adam’s reports about individuals academic performance genuinely and maturely illustrates how much attention we need to give these children for a chance through education to improve their lives, and by giving individual accounts, people who have never seen this school can get a clear idea about what is really going on.I know these children, and i know for one that they would beam with absolute pride that someone like adam would think they were important enough to write about to the rest of the world. Can i also say that nothing adam wrote about was negative or critical- he actually highlighted students improvements. I don’t mean to rant about this but there are FAR FAR more pressing issues to be dealt with at the rohana school!! Bravo, Sophie. Perspective is helpful. I agree with Sophie, but can’t help but think about how journalists typically have to get permission to publish names/photos and wonder what this means for the blogging world, hence my curiousity as to whether the parents and school know about the photos and blog. These are great! Ilove the one of you and the guys! Do the dorm kids wash and iron their clothes themselves? They are so striking in their white uniforms. The school area certainly is not drab. It appears they are partial to red, blue and yellow, my favorite colors. You are making a positive difference in the short time you’ve been there. Be proud of yourself. This really brings the whole experience alive for us readers! The kids are so cute! I-don’t- know is very photogenic. I still don’t know how you communicate so well with them when you don’t know each other’s languages. Are you fluent in Sinhal now? Whatever you do it’s working. Sophie makes some outstanding points, however, amanda makes a good suggestion. I don’t know blog etiquette, but do you think you should ask N&D or principal ( I’mnot going to attempt to spell his name) if it’s okay. if you can, please keep sharing your photos with us. it’s inspirational to see how you’ve taken a part in making the students’ smiles so contagious. plus we all love to see a bit of adam himself. i nearly want to weep when i see your photos and listen to your stories. it has re-inspired me to want to move back to india or sri lanka. thank you for reminding me of my roots. Adam!! I’ve been swimming in all your posts (my pager doesn’t seem to be sending you messages anymore??) and finally the land of photos! Beautifully taken and well observed. A great writer is also a great observer. I really feel like I know the kids personally. Ok,ok, beside the fact that I can’t spell their names…that’s beyond my scope of abilities. Keep em’ comin! Champ!!!!! We need to see more of YOU, bro! BTW, just an observation based on those photos—boys seem to get more attention in school than girls. Is that so? Not sure if that’s cultural thing.